The timber bent goes hand-in-hand with the gable-ended building. The two systems – one structural, one formal – developed in tandem, abetting each other in every aspect of the construction of space and shelter. In lifting the gabled roof, the bent thickens and defines interior space along with exterior form; it braces the form laterally, and provides a means of shedding water; and in developing the third dimension, it provides a rationality of spatial determination through relentless repetition of the two-dimensional frame in a linear forward march. The form is so well integrated that it has become an archetype of space and structure. Four Corners reimagines the timber bent as a three-dimensional construct, unfolding through space and developing unexpected forms and relationships. Using cross-laminated timber (CLT) in conjunction with the gable-ended form, it forges a new archetype of space and structure for a transformed technology. Rather than reproduce the gabled bent, which with CLT would produce a weak form, a series of structurally rigid corners of complementary proportion are cut from a barn-shaped primitive and reassembled into a cantilevering column-assemblage. Through recombination, arraying, and stacking, a varied and unexpected labyrinth arises. Where the traditional bent-and-gable construction was characterized by a clearly contained form and an inward spatiality, the space of Four Corners is centrifugal and open to its context. The barn-form’s center is voided and the space is turned inside out. While at moments the gable is recognizable, fully assembled the project is understandable not as an object but as a broader field of structurally interdependent bents cascading in a series of improvised juxtapositions. The resulting typology is a porous mat of rooms, corridors, and courtyards concatenating one onto the next in a spatial sequence that expresses itself through exploration: one corridor may lead to a courtyard with a video installation, another to a passing view of the city outside. In the end, the project proposes a confrontation between a fragmented artifact–overloaded with social significance–and its reassembly into an abstract spatial and structural order. Four Corners is a part of this expressive system composed of three interlocking column assemblies forming a network of corridors, courtyards, and outward-facing apses. The central courtyard space serves as a micro-exhibition space featuring a rotating series of video works by artist Noah Klersfeld. The corridors and apses lead to the windows looking out to the city, creating a series of semi-private rooms in conjunction with the existing architecture. Each column assembly is composed of four CLT bents cantilevering off of a central ‘column’, which is actually an extension of one of the bent walls down to the floor. Though each bent is structurally incomplete, when assembled into the four-corners column they become rigid. Likewise, once each column assembly is attached to its neighbors, they act together to become stable. CLT is used monolithically as both structure and skin, in keeping with the tradition of timber construction. 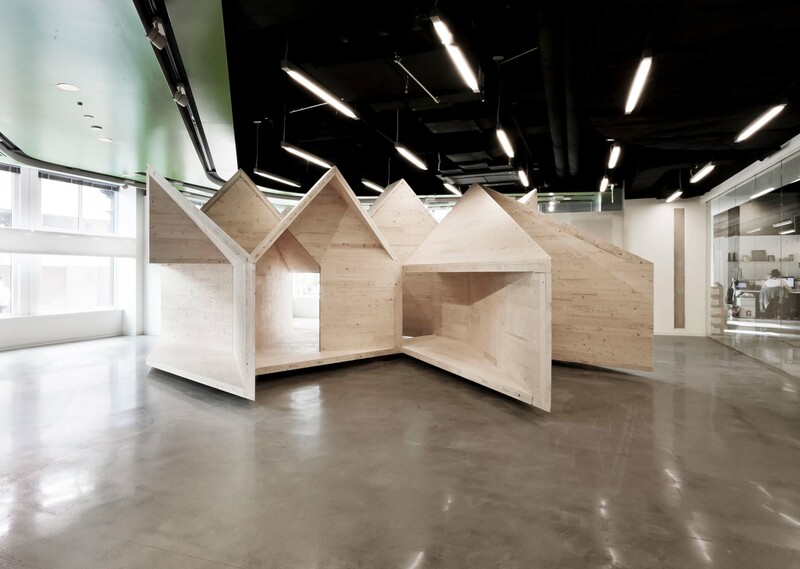 The grain of the CLT is oriented according to load condition, with column elements oriented vertically, cantilevering elements oriented horizontally, and floors and roofs spanning between the two. Four Corners was published in Timber in the City, by Andrew Bernheimer, Oro Editions, 2015.